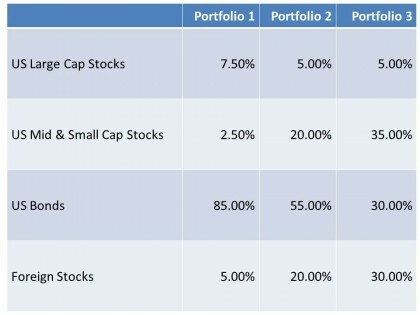 Nestor creates retirement income strategies by combining a series of product types following a prescribed methodology. Cash - The amount of cash held in the portfolio at any time is equal to the amount needed to cover any excess of spending (including basic spending, discretionary spending, and annuity purchases) over income (including annuity income and other existing sources of income) that is anticipated over the next year. The Role of Cash in the portfolio – The intention is to park an amount into cash at the beginning of each year of retirement so that your cash, plus income received during the year, will be sufficient to meet that year’s spending. 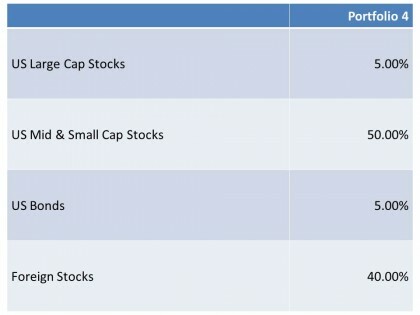 TIPs – The amount of TIPs held in the portfolio at any time is equal to the reserve savings requirement you specify, plus the amount needed to cover any excess of spending (including basic spending, discretionary spending, and annuity purchases) over income (including annuity income and other existing sources of income) that you anticipate for the 4-year period immediately following the current year. The Role of TIPs in your portfolio - TIPs serve as an inflation hedge against income needs over the four-year period immediately following the current year that are not otherwise provided for by annuity income or other income sources. Historical data suggests that inflation risk tends to be a short-term risk in most portfolios because inflation-adjusted returns on stocks tend to be over longer periods. We therefore use TIPs to protect against inflation risk over this near-term inflation risk. Role of the Growth Portfolio – the Growth Portfolio is intended to provide for income needs more than five years in the future that are not otherwise provided by annuity income or other income sources. Historical data suggests that inflation adjusted returns tend to be positive over longer time horizons. Fixed Immediate Annuities/Longevity Insurance Nestor will either use fixed immediate annuities or longevity insurance; it will not use both. Nestor selects which one to use by estimating the net cost of each and choosing the one with the lowest expected net cost. This is calculated by applying the fixed annual amount toward purchasing fixed immediate annuities or longevity insurance, so that the expected total amount of income purchases to age 86 equals the sum of basic and discretionary spending at age 86. Nestor stops purchasing annuities at age 85 because this is the maximum issue age for many life insurance companies. The Role of Fixed Immediate Annuities/Longevity Insurance – The intent is to fully fund basic and discretionary spending at age 86 with a higher degree of certainty for the remainder of your lifetime. Variable Immediate Annuities – The annual amount applied toward the purchase of variable immediate annuities is the amount required for the expected total amount of income , under the “shock drop” and other assumptions used by the model, is sufficient, along with income from fixed immediate annuities/longevity insurance (as described above) and other existing sources of income, to fund the maximum basic spending amount after age 86 and the maximum discretionary spending amount after age 86. Variable immediate annuities are assumed to be purchased each and every year until age 86, which is the maximum issues age for annuities for many life insurance companies Variable immediate annuities are assumed to be invested in the Growth Portfolio as described above. The Role of Variable Immediate Annuities – The intent is to use the growth opportunity that variable immediate annuities provide through participation in market returns to allow income to keep pace with inflation in the later years of retirement. The orange line represents the sum of other existing income sources and cumulative amount of fixed immediate annuity (“FIA”) or longevity insurance (“LI”) purchased. Note that at age 86 (when annuity purchases stop) the cumulative income from these sources exactly equals the amount of basic and discretionary spending. The green line is equal to the orange line plus the cumulative amount of income purchased under the variable immediate annuity (“VIA”). Note that the VIA income continues to increase after age 86, due to market returns – this feature makes VIAs attractive to provide for inflation in the later years of retirement. 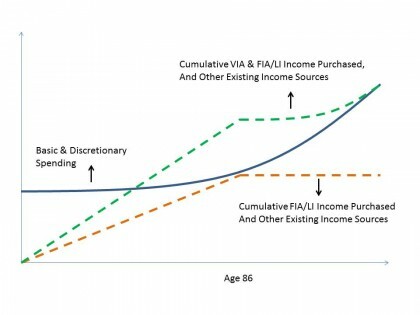 Also note that the green line touches the maximum point on the basic and discretionary spending curve, indicating that the total amount of income from annuities and other existing income sources is sufficient to provide for these expenditures. Please be advised that, although the methodology has been created with the intended result as described above, the results produced by Nestor do not always work out exactly as described above. Click here to see the your inputs that Nestor will need.